The croatian based electro label GHOST TECHNOLOGY focus on the musical anticipation continues its good work by releasing a new album of a ghostly producer. During the promotion, no details provided excepted two video clips for the purpose of travel through an abstract electronic universe (Here : 1 2). From now on, the mask fell and the name of producer is nothingless than MESAK, the half of ‘MR VELCRO FASTENER’ (& the co founder of the HARMONIA label). 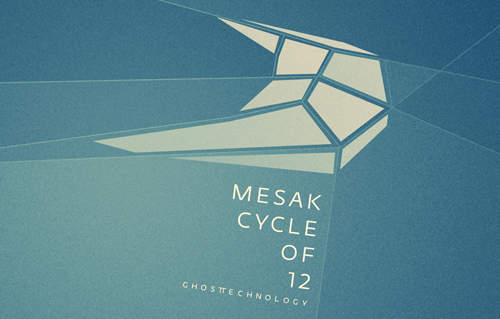 His new full length album released the 4-28-11 on GHOST TECHNOLOGY titled “Cycle of 12” features 8 tracks very well produced mixing together bass and experimental electro. The first tune “A plus B” introduces right the great mood of this project. The immersion is easy, MESAK has a groovy signature that will seduce any listeners who still have two ears. As so far, the experimental has a real position on this album and its fine texture designed a dream of a friendly futuristic world.